In honour of St Patrick’s Day on Monday this recipe from former Riverford head chef Jane Baxter is an easy way to make potato farls (potato scones). Apparently it is ideal for a novice or nervous baker! 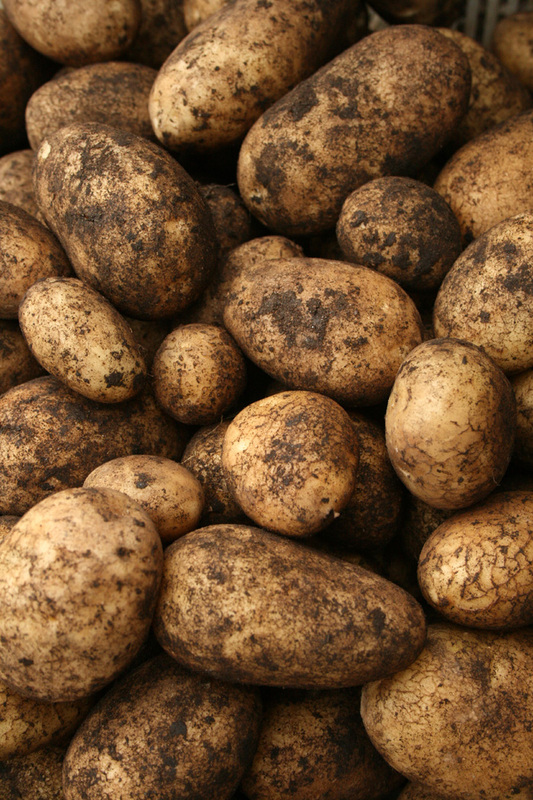 Peel the potatoes, then cut them into quarters. Cover with water in a saucepan, season with a pinch of salt and cook for about 15 minutes or until they become tender. You can check this by sticking a knife into them, it should slide out again easily. Drain well, then return the potatoes to the pan. Melt the butter in a pan and add to the potatoes. Mash until smooth. For the best results, pass the potatoes through a potato ricer or mouli – otherwise, use a standard potato masher. Sift the flour with the baking powder into the potato mix and stir to combine. Taste for seasoning and adjust, if required. The dough should come together and away from the sides of the pan. You can add more flour if the mixture is too wet and a little milk if it is too dry. Divide the dough into two halves. Form one piece into a ball, then roll it out on a floured surface and into a rough circle with a diameter of about 15 cm and a thickness of 5mm to 1cm. Cut the circle into quarters. Heat a non-stick shallow frying pan over a medium heat with a little butter to grease the surface. Transfer the four pieces to the pan and cook for around 3 minutes or until golden brown. Flip over and cook the other side for another 3 minutes. Remove to a warm plate. Repeat the process with the other half of the dough mix. Serve with lashings of melted butter and a sprinkling of salt or as part of a cooked breakfast.